WARM UP TO A BOWL OF CREAMY POTATO AND LEEK SOUP TODAY. Imagine a hot bowl of Creamy Potato Leek Soup and bacon with slices of homemade fresh bread slathered in butter for afternoon lunch or evening tea. You can stop imagining now because I have that recipe for you today which my family loves so I made a big pot earlier this week. This creamy potato leek soup recipe will keep you coming back for more until your tummy has had enough. You know that feeling when you’re satisfied and you have a great big smile on your face. This is what I get when I enjoy homemade soup. It’s hard to compare any homemade soup to a can of soup which is why I always try to make 2 large pots of soup to eat and freeze for another day. Most often I just double a recipe which makes cleanup easier too. Having done my meal planning for the next couple of weeks I decided to go with leeks in my vegetable shopping. We love vegetables and what ever is available at a price that is reasonable is good. Now you all know me by now to say that I like to cook fancy and simple dishes both equally. Today is one of my simple days, easy and tasty, something that everybody likes and can be eaten over a period of days with some lovely fluffy buns like my Scottish Baps or Mr.CBB’s Olive Bread. If you have ever wondered, leeks are a part of the onion family and there are lots of ways to cook them. There are 3 types of leeks, Summer, Autumn and Winter leeks. Easy to grow and welcome in any recipe that calls for onions, leeks (Allium ampeloprasum var. porrum) allow you to grow onion crops all year in your kitchen garden. Leeks provide a welcoming subtle flavour to many dishes from around the world. Leeks are wonderful deep-fried like onion rings and tossed on a salad once they are crunchy. You can also layer cooked dishes such as zucchini and egg-plant with leeks for added flavour. Leeks can be quite dirty and sandy, and I always wash these twice, sometimes even three times. There’s nothing worse than having dirt in your soup or on vegetables when you go to eat them. The first washing step happens after slicing them to make like a fan effect a bit like peeling a cheese string. I then wash each leek under water brushing all the dirt out. Once I chop them up I rinse them once more before draining them out ready to cook. Better to be safe then have unhappy customers. Potato Leek Soup can be silky smooth with a dash of cream to take out the slightly sweet taste you get from the leeks or as simple as using stock cubes and a bit of butter for an inexpensive broth soup. This Potato Leek Soup is ideal for those long Canadian winter nights during these frigid temperatures when all you want is something hot in your belly. What can I say soup is like a hot water bottle, it warms you up top to bottom in a very delicious way. 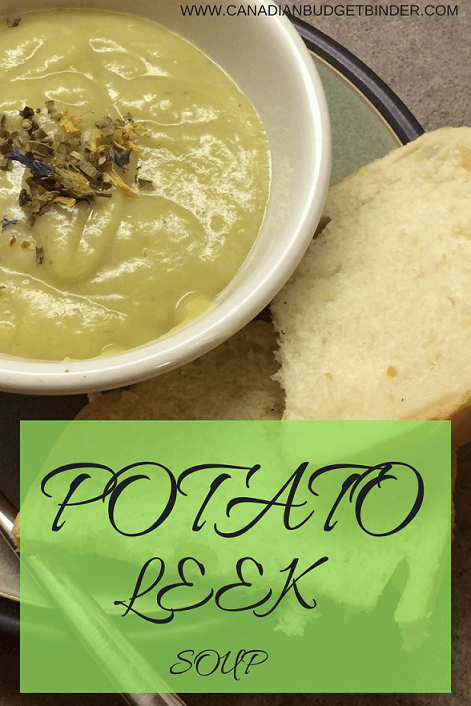 Potato and Leek soup is a lovely combination of onion and potato flavour mixed together to bring you one of the creamiest, smoothest winter soups. Wash leeks thoroughly and chop into small pieces. Place in cold water and rinse through again. In a large saucepan place the butter and oil and wait until butter has melted. Add leeks and let soften in pan for ½ hour on low on the stove top with a lid. This will create a steam effect. Add to the softened leeks and cook for another ½ hour, and place lid back on the pan. Pour mixture into a blender and blend until smooth. Add salt and pepper to taste. Pour back into the pan and add cream or milk. To finish off your potato leek soup before serving it why not top it off with crunchy homemade croutons, crispy onions, bacon or even cheddar cheese. 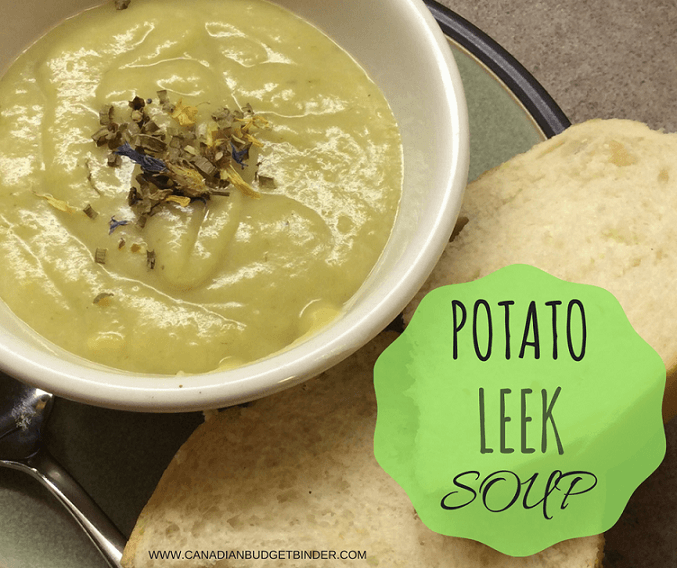 Your topping options are endless for potato leek soup since it is a neutral soup you can add layers of flavour to. There you have it! Potato leek soup from scratch that will fill you up no end even on a cold winter’s day. We just made something similar to this the other night. It was so good!